Princesses, pickaxes, concrete and a chicken. Some days have so many experiences that it is hard to even summarize them all! This was one of those days. Full of joy, laughter, prettiness, and festivities. Full of hard work, trenches, concrete forms and new stairs. Full of difficulties, heartache, and deep sadness. And full of a sense that God is among us. Today was a tough dayfor a couple of our team members….Carley got really sick this morning and after trying to make it out to the care point, it was quickly realized that she would need to head back to bed. Carolyn took her back to the guest house and the two of them spent the day trying to help her rest. I know it was very difficult for them both as they were so excited for this day. But we are grateful for both the great job of planning that Carolyn had put into this day and to a team very capable of pulling it off in her absence. Let me just say that the princess party at Bhobokazi was FANTASTIC! 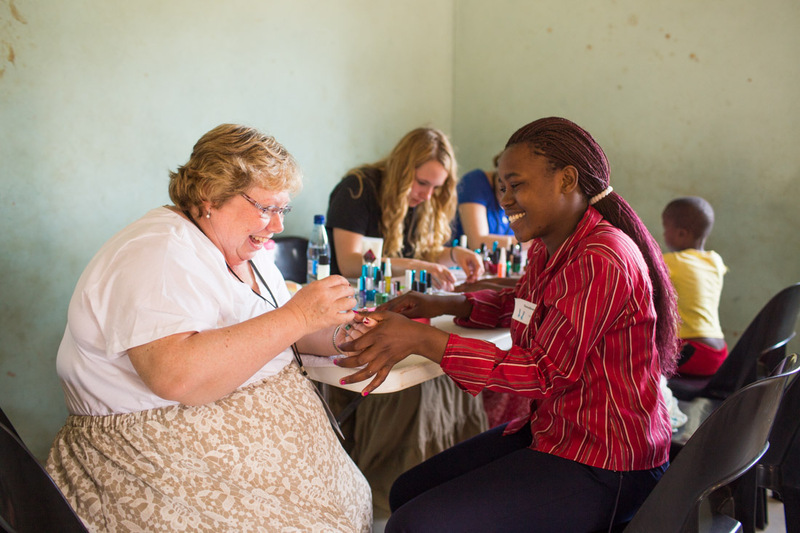 The girls LOVED their dresses and they felt so special getting manicures and pedicures and nail painted and celebrated. We began our day decorating the care point and the room for the girls. I must say I’m pretty proud of our boys who stepped up to the plate as the Princess Party Decorating Crew (all design decisions were made by Debbie….don’t worry). We just got to hang from the rafters and put up balloons and streamers. Once decorated the boys were kicked out and had the task of keeping the boys away for the whole day. The ladies did so great! They treated each of our Bhobokazi girls to a day of feeling special and being told that God has created and made them so beautiful. Char had a chance to talk to the girls and told them that this day was not just a day for them to know that we loved them….but so that they could see how much God adores them and thinks they are beautiful. Char, you did a beautiful job communicating. We also had the privilege of having Miss Swaziland as a guest for the girls to hear from and she did a great job reinforcing what Char had talked about. The kids were pretty excited to have a celebrity around. One of my favourite moments of the day was when the girls were finished and they all paraded out the doors through a tunnel of flower and cheering team members to be met by all of the boys gathered in a gallery and cheering and clapping for them. You could tell that the girls felt special and celebrated by the smiles on their faces. The boys kept quite busy too….Ron ran his own little pre-school session with the younger kids (quite out of his comfort zone but he rocked it!). Jordan & a bunch of boys headed out for a match of soccer. Murray & Andrew tackled a project of pouring new concrete stairs for the kitchen…and they had an entourage of about 12 boys 10 and under helping them to smash bricks down for aggregate and run the wheel barrows. The boys were elated to help out with the construction crew! The rest of us took shifts digging trenches and planting tires….yes planting tires. Hopefully by next year we will have fully grown tire trees….well actually they are a part of the play structure for the kids to bounce on. It really was a great day with Bhobokazi. Tonight in our sharing time, we shared many highlights of the day…..but we also spent a significant amount of time being hit by the reality of the struggles that we see in this country. We talked about the struggles that these girls face and that this special day celebrating them can seem like such a small step in the face of so many other challenges. We also learned today of another tragedy that has stolen life….a mother whom we had grieved with last year over the loss of her daughter has now recently had to deal with the loss of her infant. She is now a young 22 year old who has lost 2 children in the past 2 years and is struggling at home alone with no source of income. The reality is that this is a story that is repeated over and over again as the country struggles with poverty, HIV aids, and hunger. It was a sober reality for us today. We had a profound sense of sadness and joy mixed together tonight. I am so grateful for a group that is willing to be vulnerable together. Thanks to a team that invested so much of themselves into this day. Thanks to a church that has invested into this place and is along the journey with us. And thanks to God….who knows profound sadness deeper than any of us and is the source of all of our joy. Our prayer tonight was for the grieving mother to discover a hope that stretches beyond circumstances….may God rest on her tonight. Oh and I must tell you one more quick story. 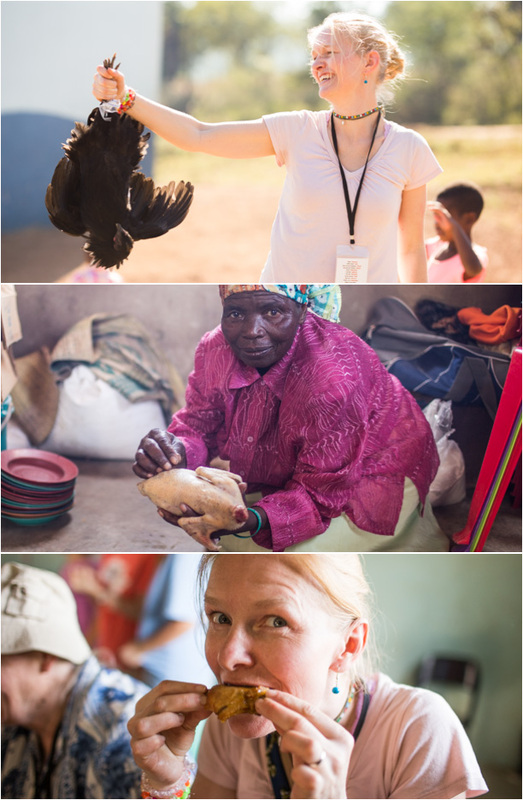 Today Ingrid received a gift from the homestead she visited 2 days ago….they presented her with a live chicken! This was truly an honour….but we had no idea what to do with it! She carried it around for a while….then it became clear what was to be done….I will let the photo finish the story for you. What a day it has been. We arrived at Bhobokazi early to set up for our first Princess Party. We had mirror decorating stations, a flower making station, and a manicure and pedicure station. I was at the manicure station where I made about 200 nails beautiful. Such beautiful, beautiful girls. One of the older girls, about thirteen years old, thanked me for making her beautiful today. I told her she was already beautiful when she walked into the room, what a smile came over her face. Miss Swaziland came and spoke to the girls about the importance of having God in their lives and that they were all princesses because they were children of the King. She also said she grew up in a home where her mother and father taught her that she was beautiful and that God loved her. The girls hung on her every word. Seeing the girls in their Princess dresses from their Special friends was so wonderful. I have never seen so many smiling faces in my life. I am so blessed to be able to be here and pour some loving on these wonderful children. We also were blessed enough to go on a home visit to Erik and Yvonne’s little girls home. We went with her Gogo and her two siblings. The gogo also works at the carepoint and looks after 7 children. They live in a very small house and she thanked us many times for being their guests. I thanked her for all the work she does at our carepoint and she had tears in her eyes. Hi Bon we are all here at the bible study and we are thinking of you and praying for you. We enjoyed seeing the pictures and we are glad you all had a safe trip. It is not the same when you are not here to answer the phone, Debra had to call twice to get in. ha,ha,ha. It went really well at Siloam and we appreciate all the hard work you did to make it possible. Enjoy the rest of your time and we will see you in a week and half. From your Home-group. Well done team!! Love the dresses, nail polish and chicken – how special. The smiles on your faces say so much – you are all pouring so much of yourselves into making these special kids feel so loved and not forgotten. Praying that Carley will feel better and that you all are sleeping well. Keep drinking it all in – memories for a lifetime! love you t – oh and p.s. dad pulled a tawanda (think Fried Green Tomatoes) on the basement the other day – yep – no more carpet. I’m so happy the Princess party was a smash! I’m sure everyone loved it, and you’re all so special. Looks like a wonderful Princess party. Thanks for the report Cheryl. I can imagine all those beautiful smiling faces. My heart is breaking for the young mom who has lost another one of her children – so much sadness. Team our hearts and prayers are with all of you and especially for that precious mom. Carley we are praying for a speedy recovery. Kailey thanks for the picture with our special friend. Cheryl thanks for loving on our swazi daughter and her Gogo…they are so special to us. My heart is breaking but also rejoicing. God is so faithful and all of you are making such a difference in these precious lives. Keep up the great work. We love hearing the stories and how you are allowing God to break you and mould you. Ingrid you looked right in your element with the chicken. Have a good sleep and a wonderful day tomorrow. Hey Team .. Awesome job with the princess party! Murray., you made my day. I was searching the pictures as I do everyday to see the face of my special friend Mayibongwe and suddenly there he was! Not only was he behind you Murray in your group pic , but you guys took the picture right in front of the spot in the mural painting where I knelt with my boy . It was where I hugged him and told him I was leaving s little bit of me behind and that when he came to the care point he could think of me when he looked at the painting and know I loved him and would be thinking of him too. Thank you for giving me back that memory! What a great day team! It is so wonderful to be following along with you and reading about your experiences! Dad, I’m left here speechless…. thank you for loving on our girl. Reality hit me as to why when I send a care package, or say a little prayer for our special friend, God brings me to my knees every time. We are called to care for the weak, the poor, the sick and God will bless them. He has through you. I can’t even imagine all that you are experiencing. My heart bursts for you and you are in my prayers! I pray that as you work through all of your emotions and thoughts, you hear one thing, “well done my good and faithful servant!” I love you Dad! I’m so thankful that after so many years, you are where you need to be! Andrew!!! It is so much fun looking at pictures of you and seeing you in a place I have always felt is where you need to be!! God is so good! He restores us and brings new life! 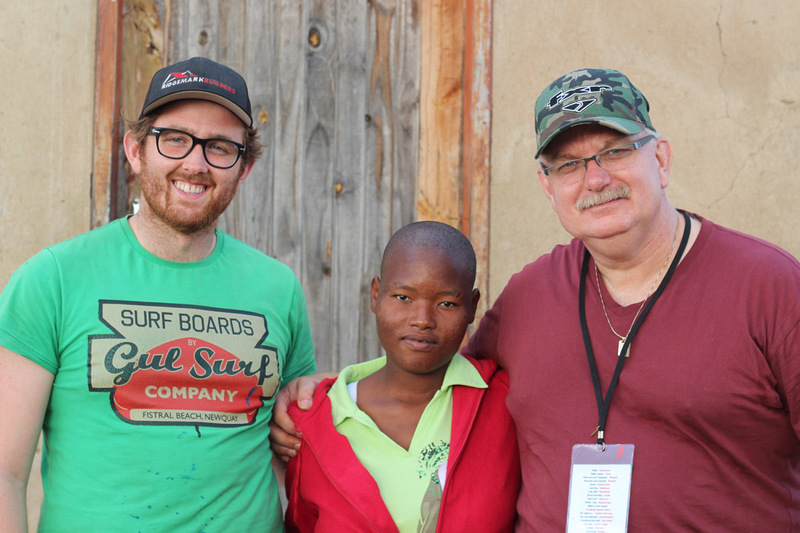 I am sooooo thrilled to watch you work and play in Swazi! Have a great time with the boys!!! We love you both! Good work team! Tears came to my eyes as I read about how hard you worked to make sure that each of those girls knows how precious and beautiful they are to God and that they are royalty. We can only imagine how much that means to them. Murray, reading your post, I think back to the conversation we had a couple years ago about Africa. It makes my heart swell and puts a big smile on my face to hear of how you’re heart and mind are being opened to this experience and how God is showing you what everything leading up to this point has been about. God is great! And good for you for being obedient and faithful in His leading. Saying a prayer for Carley! Hi Deb & Brenda and the rest of team 2010/2012! Get rest and give it all again tomorrow! We love hearing from you all and seeing the beautiful pics again! Carolyn & Carley we prayed for you last night at smallgroup and will continue to – that Carley you would be completely well again! You are both so dear and we lift you up and support you from here. Paul we missed you at smallgroup last night and prayed for you too. Ingrid – love seeing your face holding the chicken!! You’re a brave woman in so many ways! We love you! My heart aches for the dear mom who again lost another child! “Dear God have mercy on this precious woman! Wrap your arms around her dear Lord, and may she know deep deep consolation from You!” To everyone on the team, we love seeing your faces of joy and “being present” for so many! Every story comes wrapped up in grace…. so moving really! btw Jon glad that you could finally be on a picture too! The photographer is rarely photographed so glad you can be on some of the pics too! Blessings all with many prayers! So impressed by all of your kindness, love and generosity. All of what you’re doing will leave a lasting impression in the hearts of all you’ve met as well as yourselves. Memories for a lifetime. Precious! Oh my goodness you guys have been busy! Sylvia, leave it to you to go across the world and be able to be a princess for a day!! 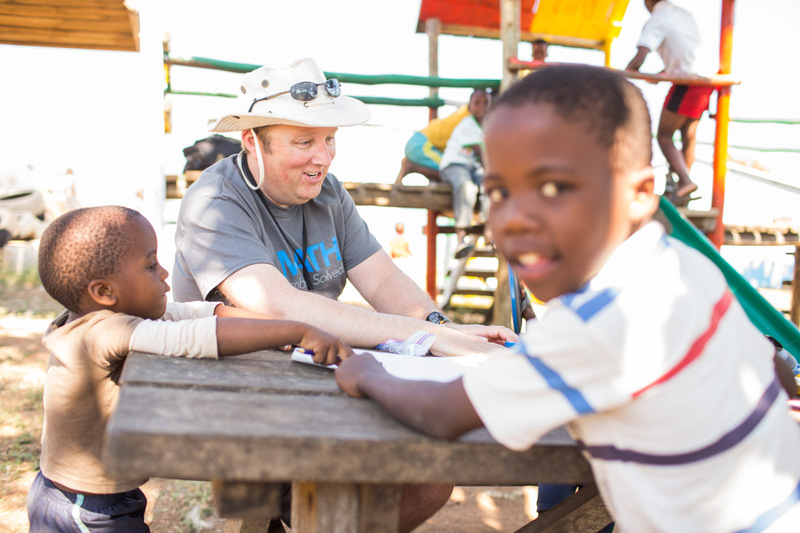 I can only imagine how out of this world that experience was for the kids….not to mention tonnes of fun for you:) Your girls will love that you esentially brought one of their favorite things to do, to kids in Africa. Amazing memories! Amazing! Its aϲtually remarkable article, ӏ havе got much clezr idea aboit from this article.